Sunday ended up being our funday in Florence. We get up early as it’s the first Sunday of the month and the museums are all free. This will mean larger than normal tourist crowds and very busy. Florence is about an hour’s bus ride away from the estate. We arrive and are greeted by our guide at the Academy Galleria which features the statue of David by Michelangelo. 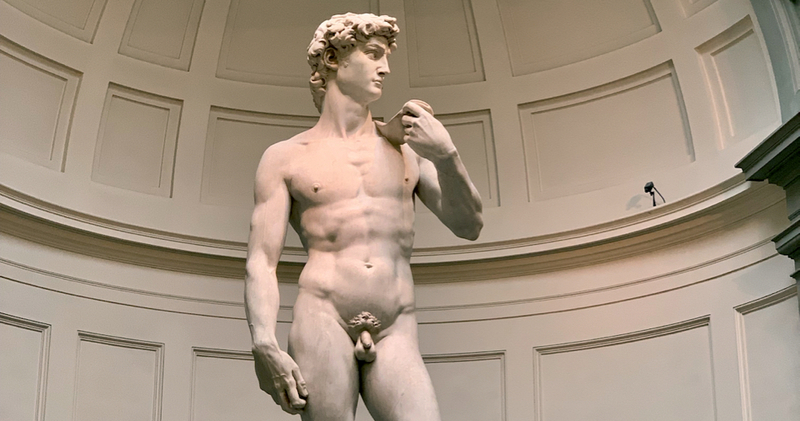 Among the museum’s sculpture collection are several other unfinished works by Michelangelo. We wind our way walking the ancient streets making our way to the Il Duomo and Baptistery which aren’t open just yet, as it’s Sunday. Our journey continues as we walk over the Ponto Vecchio and have lunch at a superb ristorante with an amazing artichoke bruschetta. The deconstructed cannoli was just ok for dessert, too. Chef Paolo takes us back to the plaza where the Uffizi museum is located and are left to be off on our own. The weather today is sunny and I debate climbing the steps to the top of the dome. However, the Sunday services have caused quite a delay to get in to any of the attractions. Logan and I end up walking around window shopping. We both want a beer and I find a pub that also has the local soccer team’s game on. A fellow pub patron wishes me, “Go Dolphins” at me for my beanie. Fins fans are everywhere. After that match, I’m able to see the first 20 min of the Manchester City game against Arsenal. I saw Aguero’s goal in the first minute. Awesome. I got a little confused on where we were to meet the group which caused us to be a bit delayed. I joked we were running on Italian time. We went to dinner which was not one of my favorite meals. We are served portions of Florentine steak which, again, is not tender and overly charred. We do enjoy a traditional nightcap of fortified wine with biscotti. HIking back to the bus, we venture back to the estate heading to bed for a very busy day on Monday. So much to do.